Undoubtedly Mohawk is one of the boldest hairstyles, it’s mythical that not everyone can pull it off well. This versatile style has evolved to include countless variations and the latest invention is cocktailing different braided Mohawk hairstyle with a weave. We have chosen most 12 prominent braided Mohawk hairstyle with weave hairstyles for you to experiment this season. Get inspired and slay the fashion world and stand out in the crowd with these braided mohawk hairstyles. Black women have slain the mohawk hairstyle from the very beginning. With the coalition of braid and mohawk with technique has bucked up white women as well to try this out. 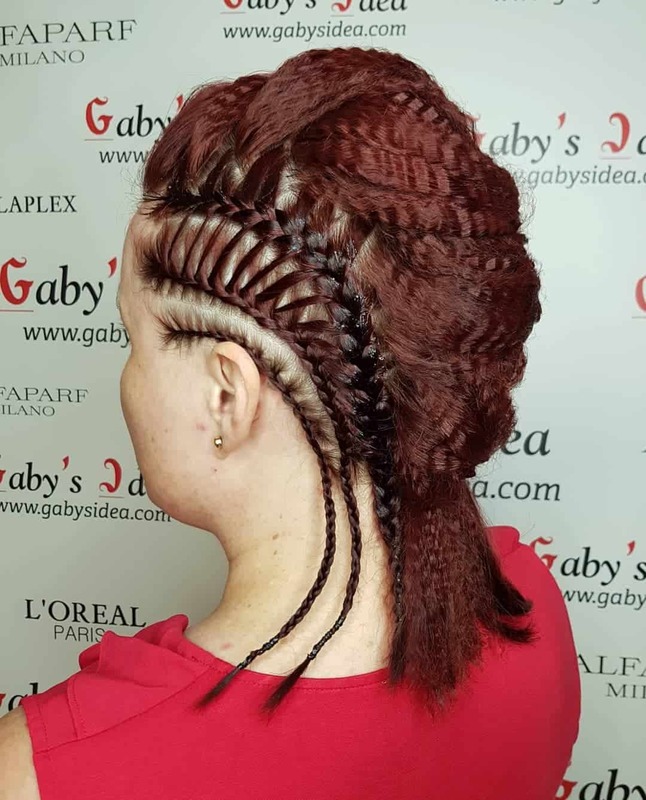 Braided mohawk hairstyle with weave lets you keep your hair and try out these gutsy styles moreover, they come in all shapes and sizes and can often be done on your own except for cornrow or box braid you’ll require professional help. Browse these braided mohawk hairstyles and you will get your desired one in no time. The elegant cornrow braid Mohawk hairstyle with a weave is a smart choice for a working woman going for business meetings or formal dinners. Ideal For: It is ideal for thick textured hair. It looks awesome on an oval face shape. How to Style: Make multiple cornrows on both sides of the head in an upward direction. Now gather all these cornrows at the central area of the head. It is like a small pompadours hairstyle. The light makeup, Smokey eyes, and big round earrings incredibly enough to rock with. Ideal For: It is ideal for medium and short hair length. How to Style: Make braids from both sides of the head, toward the top of the head. Gather the hair at the central area of the head. Keep the top straight and a little messy in order to achieve the spiky look. Add more life to the braided Mohawk spikes with the combo of brown and silver blonde. It is an innovative and incredible addition to braided Mohawk hairstyles. This Bun weave Mohawk hairstyle with braids will surely succeed to get the attention of the audience around you or your fellows. Ideal For: It is ideal for long hair. It suits both oval and oblong face shape. How to Style: The hairstyle involves three layers of hairstyle. First the sides and back of the head got shaven, and then two to three inches of head got trimmed. Now the central hair left extra-long. Make braids of longer hair from the downward direction to upward direction. Twist the braided hair and make the bun at the top of the head. Black and silver blonde hair adds an alluring factor in the Mohawk bun. 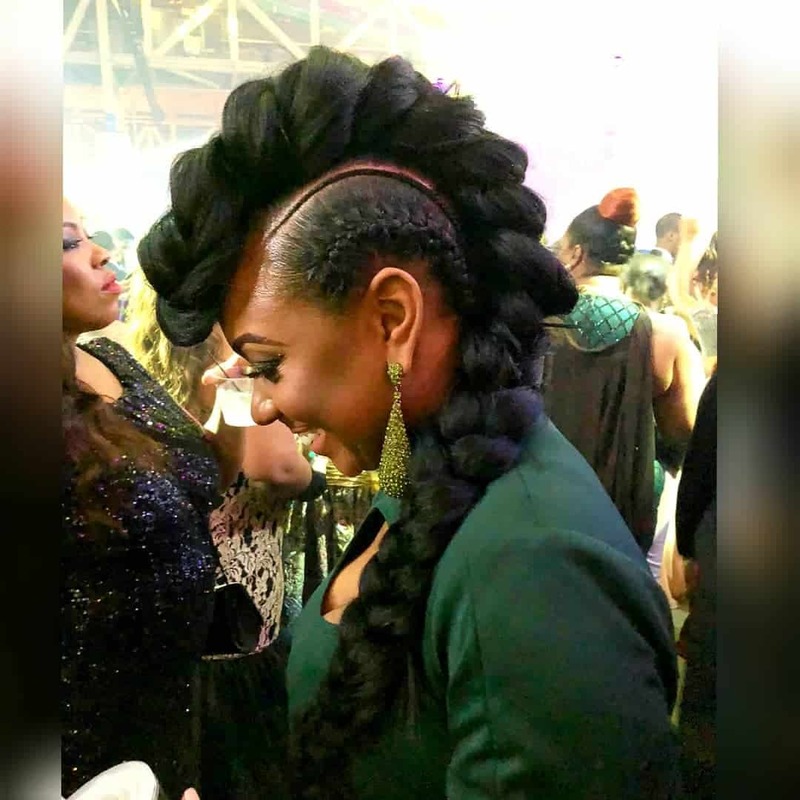 If you are an afro and want to have an edgy hairstyle for yourself then, the braided afro Mohawk hairstyle with a weave is particularly for you. Ideal For: It is ideal for short hair. It looks perfect on an oval face shape. How to Style: Make the braids in a row on both sides of the head. The short afro hair at the central area of the head resembles the shape of a Mohawk. 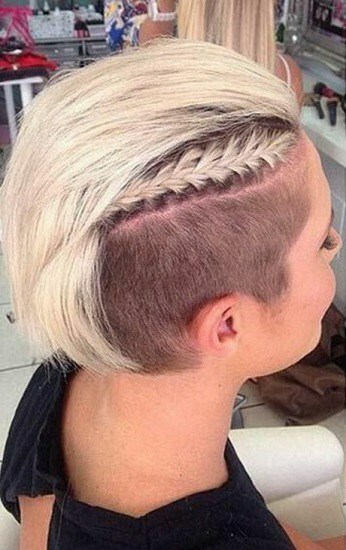 The gorgeous French braid Mohawk hairstyle is surely going to be the dream hairstyle for the girls having long hair. Ideal For: It is ideal for an oval face shape. It is ideal for long straight hair. If you do not have long hair then, worry not. Use weaves to achieve the look. How to Style: Make two simple braids at both sides of the head and hold it with a bobby pin. Divide the upper hair into three section and start braiding them in order to achieve the French braid. Conjoin the braids of both sides of the head at the back of the head into the weaves. Now create volume in the French braid with the help of a pointed tail comb. Pull the weaves carefully. The voluminous top of the head resembles the Mohawk shape. The ultra-stylish and chic Mohawk with the combo of the single braid and an undercut is an enchanting hairstyle with a weave for those girls who are worried regarding styling their short hair. Ideal For: it is ideal for short and straight hair. How to Style: Trim the sides and back of the head. Keep the top of the head relatively long. 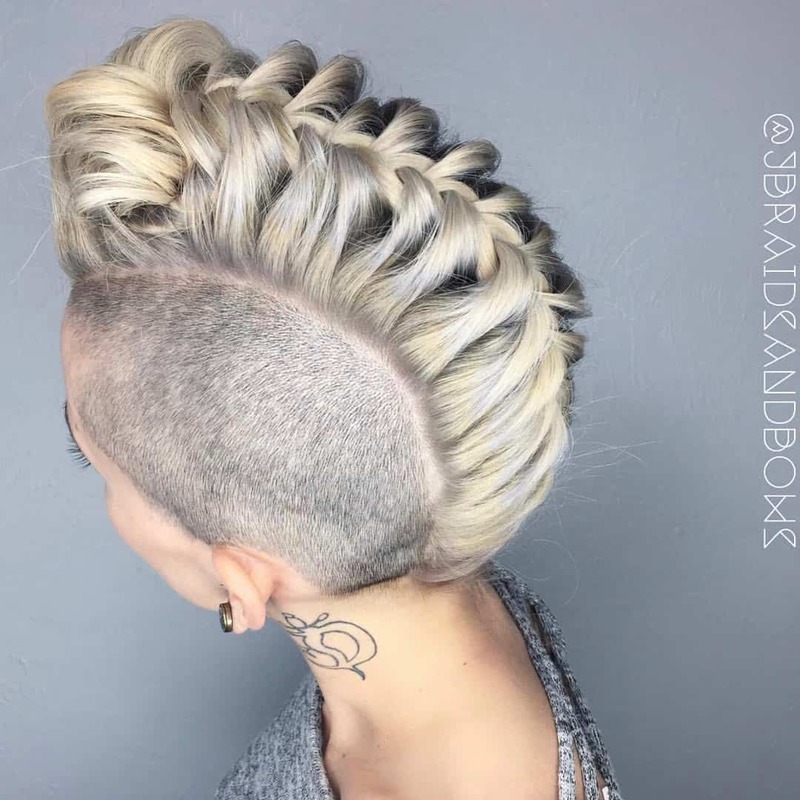 Simple single braid on one side of the head is enough to grab the attention with the combination of an undercut and Mohawk. Silver blonde hair makes the hairstyle more charming. Jada Pinkett has given another definition to a simple box braid or a Mohawk hairstyle. The box braid Mohawk, a look that never fails to grab the attention of people and a look that always inspires people’s thought. Ideal For: It is ideal for long hair. It suits an oval face shape the most. How to Style: Gather the box braids at the top of the head in the form of twists and several weaves in order to achieve the Mohawk look. Conjoin the side braids at the back of the head. Leave the back box braided hair half opened. You can also make an updo of back hair. The choice is all yours. The crimped hairstyle was introduced in early 1972. 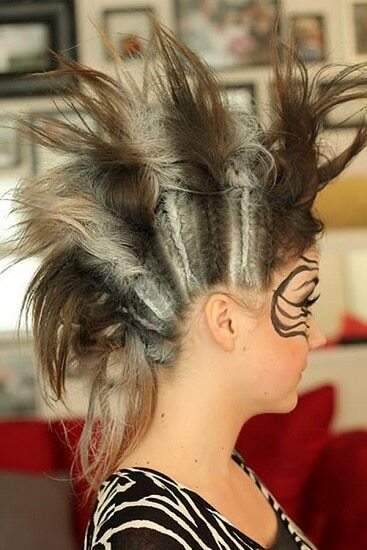 Someone did an amazing job by giving a new definition to crimped hair in the form of braided Mohawk. 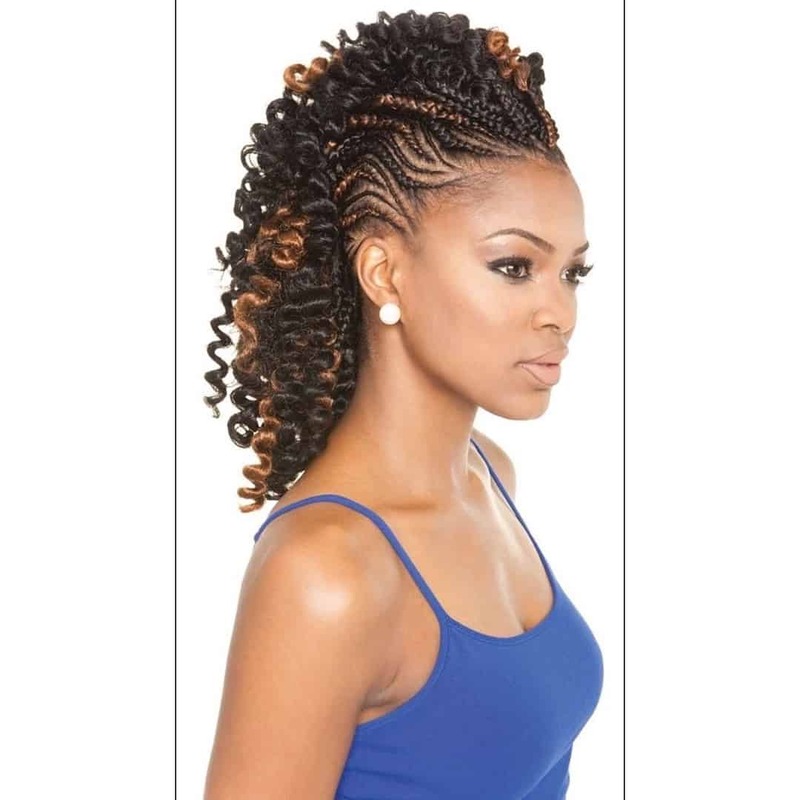 The crimped braided Mohawk with weave will surely make you stand out in the crowd. Ideal For: It is ideal for short hair length. How to Style: Make lace loop braid at both sides of the head along with a single braid. Turn the top hair of the head into deep waves or crinkles by the method called crimping. Crimping usually achieved with the help of crimping iron or by braiding the small sections of the hair. Now twist the crimped hair slightly to achieve the look of a Mohawk. Want an edgy and stylish hairstyle for a prom party? Try this ultra-chic braided Mohawk hairstyle with weave to steal the heart of people by your looks. How to Style: Separate the sides of the head from the top with the help of thin braid. Now make a single braid on both sides of the head. Now use long braided weave on the top of the head to complete the look. 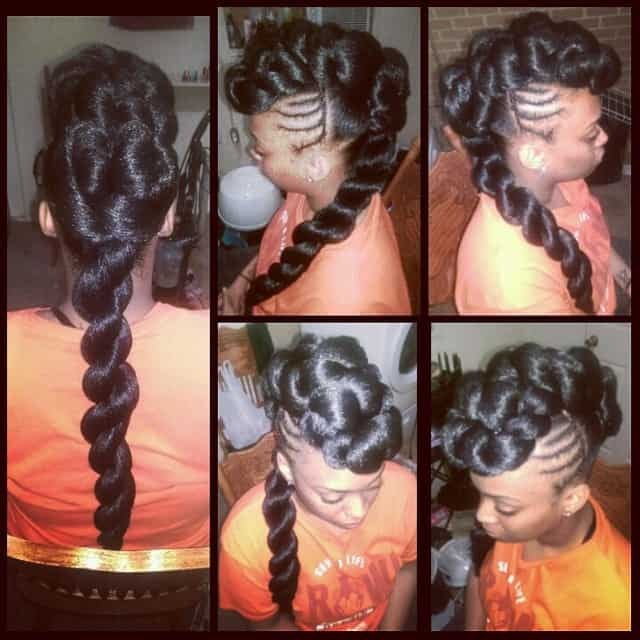 Braided Mohawk hairstyle with a weave is trending rapidly amongst women who have thin hair. Here is another bewitching hairstyle with the combo of vibrant highlights that reveals the youthful appearance of women. Light matte makeup is a perfect choice to go with this hairstyle. How to Style: Swept back all your hair and make multiple cornrows. 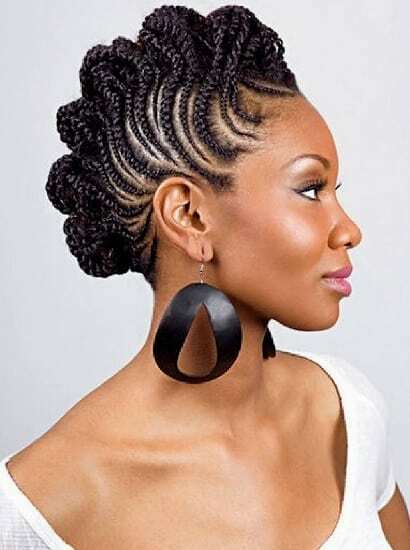 Wear the curly weave Mohawk conjoining with multiple cornrows at the top of the head. You can play with any color but the golden brownish highlights work astonishingly on black hair. Are you bold enough to try shaved sides of your head? 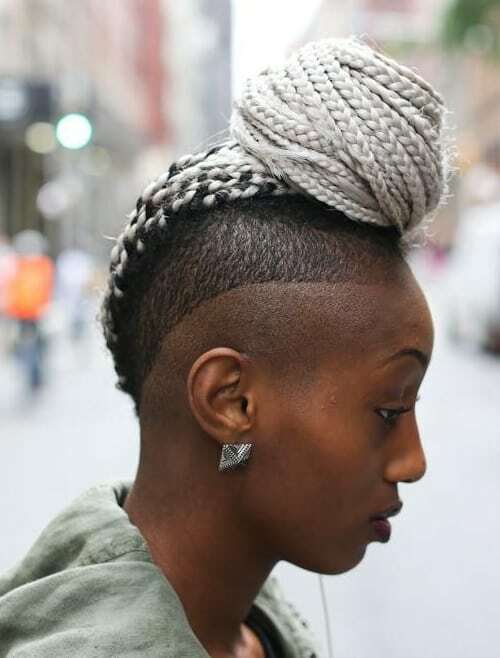 Try this butch braid Mohawk hairstyle with weave and shaved sides to glamorize your personality. Ideal For: It is ideal for medium length to long length hair. It suits oval as well as square face shape. How to Style: Start braiding your hair from downward to the upward direction. If you have thin hair then, incorporate weave into your hair. Front bangs brushed back beautifully, conjoining the weave. Silver blonde hair adds an alluring factor to the hairstyle. 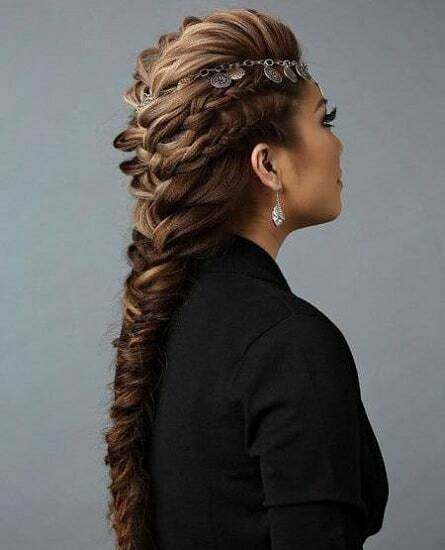 Loose tucks of each braid crossing through the pointed tail comb in order to achieve a voluminous Mohawk look. It is an innovative and easy way to style a Mohawk with the weave. It is particularly for those girls who find it difficult to have complicated braids. It is easy to carry and maintain as well. Ideal For: it is ideal for any hair length and texture because it involves the weave application. How to Style: Make for twisted thin braids on both sides of the head in order to make the top twisted weave braid more prominent. Side swept the long twisted braids on one shoulder for a tame and balanced look. If you have come all the way down here to this conclusion I hope you have found a braided mohawk hairstyle with weave you really loved. If so hurry up and go to your hairstylist and show the photo to get it done. You can do a style without having to lose your hair permanently. Every once in a while you should egg your bold self on and let it have its quoted time to have fun.